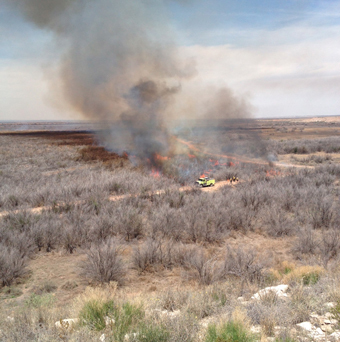 Bureau of Land Management crews watch as brush burns in the Lake McMillan area Tuesday morning. The BLM began the controlled burn on the north end of the empty lake bed, burning a fire line around the bed, then into the center. As smoke wafted into Artesia early Tuesday afternoon, residents expressed concern over the decision to burn amidst high, gusting winds, but the BLM reports several fire control apparatus trucks from surrounding BLM districts were on hand and the burn was without incident.